CDF head Cardinal Gerhard Muller has repeated that divorced and remarried couples must live in continence if they want to receive Communion at Mass and this teaching cannot change, writes Michael W. Chapman at CNS. Cardinal Muller explained this point in an interview with the Italian magazine Il Timone, portions of which were translated into English in the newspaper L'Espresso and re-published in the The Catholic Herald. The topic is controversial because of Pope Francis's letter Amoris Laetitia, which not a few bishops have proclaimed permits the divorced/remarried, who are living as man and wife, to receive Communion, although they are objectively in a state of adultery, a grievous sin. 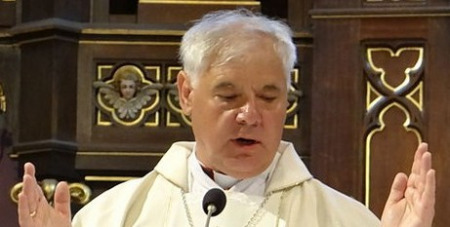 In the interview, Cardinal Muller was asked, "The exhortation of Saint John Paul II, Familiaris Consortio, stipulates that divorced and remarried couples that cannot separate, in order to receive the sacraments must commit to live in continence. Is this requirement still valid?" Cardinal Muller said, "Of course, it is not dispensable, because it is not only a positive law of John Paul II, but he expressed an essential element of Christian moral theology and the theology of the sacraments. "The confusion on this point also concerns the failure to accept the encyclical Veritatis Splendor. For us marriage is the expression of participation in the unity between Christ the bridegroom and the Church his bride. This is not, as some said during the  Synod, a simple vague analogy. "No! This is the substance of the sacrament, and no power in Heaven or on Earth, neither an angel, nor the Pope, nor a council, nor a law of the bishops, has the faculty to change it." Cardinal Muller added that "Amoris Laetitia must clearly be interpreted in the light of the whole doctrine of the Church ... I don't like it, it is not right that so many bishops are interpreting Amoris Laetitia according to their way of understanding the Pope's teaching."